This text is in Spanish; now you have my translation, and the original below. 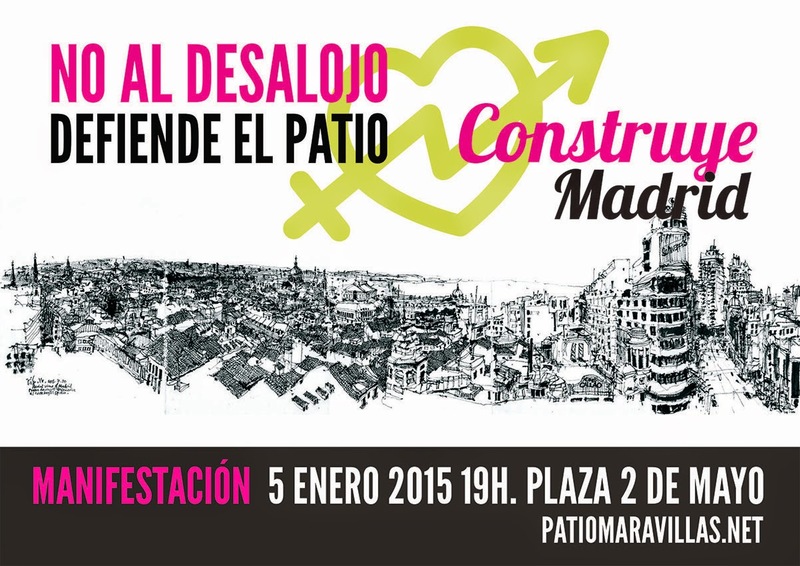 It is an important manifesto for the urban spaces of Madrid. Some are legal, some are not. All of them matter... The manifesto hasn't been published -- it's still in formation. But it makes a case, and it's brightened my day, so I share it, and put in some links to the projects discussed. MANIFIESTO POR LOS ESPACIOS URBANOS DE MADRID. One of the most fruitful situations which has marked our periods has been the multiplication of self-organized urban spaces. They have appeared as an enormous raising of consciousness among the citizenry, a signal that they must take part in the organization of their city and their space. Self-organized spaces of every kind -- public spaces, social spaces, cultural spaces, spaces in the center and in the peripheries, citizens' spaces, neighbors' spaces, whatever you want to call them. There are both spectacular places and spaces of reflection. They have hybrid organization: they are from the city or independent; they are busy (ocupados), they are squats (okupados), leased, rented, ceded space, liberated... They are areas which return to the city and the street the essential functions of stage setting and atmosphere for life in common. These spaces have proposed that Spanish cities be made livable for everyone and everybody. These especially are the places that make Madrid the lively city in motion that it is today, instead of a gray city that can only eat the offal of the crisis. They are the laboratories where the future is being designed, where the possibility of happy lives is designed. Thousands of people have participated in the "Stop Desahucios" (evictions) campaign, and the movements of resistance out of pure common sense, in all the neighborhoods threatened with gentrification -- the house at Ofelia Nieto 29 in Madrid, the barrio of Cabayal in Valencia, or the Averly factory in Zaragoza. The real possibility of another organization of the housing crisis has been proposed by the PAH [Plataforma de Afectados de Hipotecas/Platform of those affected by mortgages, the anti-eviction movement], involving the Las Corralas [housing complex] of Seville, the blocs of PAH in Sabadell and Cava, Leona and Manuela and Cadete in Madrid -- a great change of attitude is offered by the PAH to a society stricken with the sickness of real estate. The prototypes needed to think a future of public space for common benefit are put into play every day by, among others, El Forat de la Vergonya and Recreant Cruïlles in Barcelona, El solar Corona of Valencia, El Campo de Cebada, Esta es una plaza, and el Solar de Grilo in Madrid -- all the urban gardens that have proliferated throughout the country, and all around Madrid. In Tetuan, among the people of Vallecas, the social bonds between diverse groups are reconstructed while vegetables are cultivated. The trajectories of the veteran spaces also deserve note -- La Casika of Móstoles, La Casa Invisible of Málaga, and the Patio Maravillas of Malasaña, which, after many years and overcoming many aggressions, have to keep fighting for their spaces as hard now as ever. It is as if nothing has been learned about them, with them, or from them. Astra in Guernica, and Can Batlló in Barcelona are unstable mutant successes, unthinkable before they occurred, even in the midst of brutal attacks and the destruction of Can Vies. The relative stability of the Ateneu Candela de Terrasa, the Harinera of Zaragoza, or the HirikiLabs of the Tabakalera of Donostia, and the ability to listen of Medialab Prado and Intermediae in Madrid show that these places are possible, that they are not only the flowers of a day, flowers of an exquisite aroma and early death. These movements have a persistence that is not confined to the four walls they try to hold on to, but which can mutate and adapt to their context. This knowledge only needs to be alerted to awaken again. In addition to the constant threat of criminal evictions for thousands of families, many of these places are threatened these days. 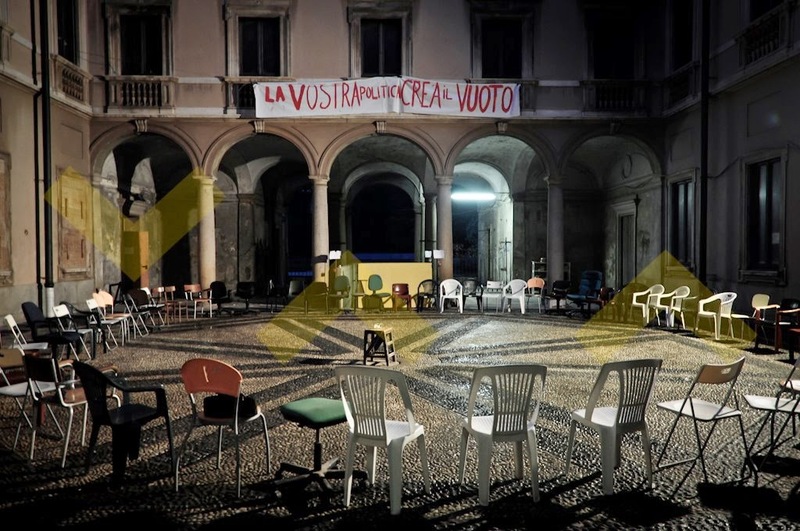 Since the shuttering of the Casa Invisible in Málaga at Christmastime, since the preventative eviction announced for the Patio Maravillas this Friday, how our cities are organized is really at stake; our lives are at stake. 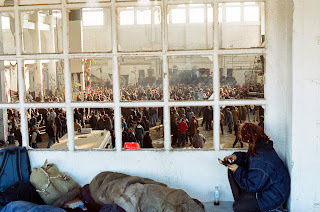 Last week, the Campo de Cebada announced their weariness on their Facebook page. They are tired of the violence and neglectful behavior by the thousands who use that space. This place has been waiting since December for a new agreement which had been offered to the neighborhood.by the city government to use the space for five more years. The Solar de Grilo, meanwhile, has been threatened with eviction, just at the moment when it was becoming most publically visible. 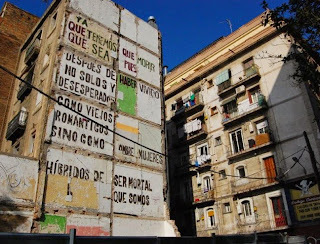 We still feel the treacherous eviction of a block of social housing organized by the PAH, "La Cava," where 13 children lived, the demolition of the house at Ofelia Nieto 29, and the social center Can Vies in the barrio Sants of Barcelona, and the occupied social center La Traba. That led to the staking of a claim to a market of fruits and vegetables for the neighbors in Legazpi, organized as the Espacio Vecinal Arganzuela (EVA), who meet now every Tuesday at Matadero Intermediae together with many friends including the FRAVM (the regional association of neighbors of Madrid). Very close by and suddenly, the city government has announced the quick construction of an enormous commercial center, against all social and urban logic, a project which EVA us determined to oppose. Throughout Europe and the rest of the world there are similar ventures, and similar experiences, but the Spanish examples have been admiringly studied by all. Always the collective intelligence stands out -- that in turn generates a management of the crisis in which we are all immersed. One must also realize the pride among those who are closest, who care for, build and defend these projects now, because to defend these projects is to defend our lives. A possible life more dignified and happy for everyone. We must defend them now before they disappear, for only then will we realize that we cannot live without them. The stakes are really, how we live, manage, design and build our cities. Tomorrow will be too late. We know that in the spring of 2015, with its accelerated election cycle, things will start moving. But no politician who think that politics is only to vote every four years can destroy our lives and our cities. For all these reasons, we demand the right to the city. We demand that the citizens and institutions of Madrid care for and be responsible for these spaces by helping them to grow and continue to exist, that they can continue their doing-in-common. We could start with the relocation of the Patio Maravillas to a muncipal area, and the suspension of its eviction until that space is given with full guarantees. We know very well that even as we maintain our requests, the need for a social center never vanishes after its eviction, and that the conquest of new territory in the city is in our hands, and in our ability to organize. New locks will find new picks, and new hegemonies will find new balances. The urban territory is a hostile environment, and people need to humanize it. We go on. We also call from here on for the defense and caretaking of all those spaces that have allowed us to be and do in common. 8 a.m. Calle Pez, 21. Malasaña, Madrid. Una de las situaciones más fructíferas que ha dado nuestra época ha sido la multiplicación de espacios urbanos autogestionados, que han venido aparejados a una enorme toma de conciencia de la importancia que debe tener la ciudadanía en la gestión de la ciudad y del territorio. Espacios urbanos autogestionados de todo tipo: espacios públicos, espacios sociales, espacios culturales, espacios centrales y periféricos, espacios ciudadanos, vecinales o como lo quieras llamar. Hay espacios espectaculares y recoletos, los hay de gestión híbrida, municipal o independiente, están ocupados, okupados, cedidos, alquilados, liberados… Espacios que han devuelto a la ciudad y a la calle su función imprescindible de escenario, entorno y ambiente de la vida en común. Han sido los espacios que han propuesto ciudades españolas vivibles para todos y todas, y en concreto, los lugares que han hecho de Madrid la ciudad viva y en marcha que es hoy en día, en lugar de la ciudad gris que le deparaba comerse los despojos de la crisis. Son los laboratorios donde se diseña el futuro, donde diseña la posibilidad de las vidas felices del futuro. 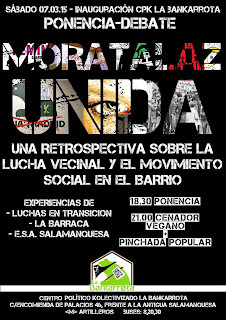 Los miles de personas que han participado en Stop Desahucios, y en los movimientos de resistencia por puro sentido común, como son todos los barrios amenazados por la gentrificación, la casa de Ofelia Nieto 29 en Madrid, el barrio del Cabanyal en Valencia o la fábrica Averly en Zaragoza. La posibilidad real de otra gestión de la crisis habitacional que ha propuesto la PAH, y que suponen Las Corralas de Sevilla, los bloques de la PAH Sabadell y la Cava, la Leona, la Manuela y Cadete en Madrid, así como el gran cambio mental que la PAH ha ofrecido a una sociedad inmobiliariamente enferma como la nuestra. Los prototipos necesarios para pensar el futuro del espacio público como bien común que ponen en marcha cada día, entre otros, El Forat de la Vergonya y Recreant Cruïlles en Barcelona, El solar Corona de Valencia, El Campo de Cebada, Esta es una plaza, y el Solar de Grilo en Madrid, así como todos los huertos urbanos que han proliferado en todo el estado, y también en todo Madrid, de Tetuán al pueblo de Vallecas, donde se reconstruye el lazo social entre grupos muy diversos que cultivan su sociedad mientras cultivan verduras. Lugares tan distintos entre sí como el Espacio Vecinal Montamarta de San Blas, El CSA La Tabacalera de Lavapiés, La Morada en Chamberí, el centro social Seco y la Villana en Vallecas, o el puente de colores de San Cristóbal de los Ángeles, han permitido que la gestión urbana "desde abajo" se extienda por toda la ciudad de Madrid, gestionando cada vez más realidad. Sin olvidarnos de los varios lugares que ha ido recuperando la gente de Moratalaz, la última una oficina de Caja Madrid abandonada, (poco antes de que muchos de sus activistas fueran detenidos, la semana pasada, de la manera más escalofriante por sacar una pancarta en un pleno municipal). Nota aparte merecen las trayectorias de las veteranas La Casika de Móstoles, La Casa Invisible de Málaga, y el Patio Maravillas de Malasaña, que tras muchos años y después de haber superado muchos procesos de agresión, tienen que seguir luchando por sus espacios tanto como el primer día. Como si no hubiéramos aprendido nada en ellas, con ellas, de ellas. Los inestables éxitos mutantes de Astra, en Gernika y de Can Batlló en Barcelona, siempre prototipando caminos y soluciones que eran impensables antes de que ocurrieran, incluso en medio de agresiones tan brutales como el derribo de Can Vies. La relativa estabilidad de el Ateneu candela de Terrasa, La Harinera de Zaragoza o los HirikiLabs de Tabakalera de Donostia, o la capacidad de escucha hacia Medialab Prado e Intermediae en Madrid demuestran que estos espacios son posibles, que no sólo pueden ser flor de un día; flores de olor exquisito y de muerte temprana. La persistencia de movimientos que no se ciñen a las cuatro paredes que los intentan contener, que tienen capacidad de mutación y de adaptación al contexto. El saber que solo hace falta una alerta para despertarnos de nuevo. 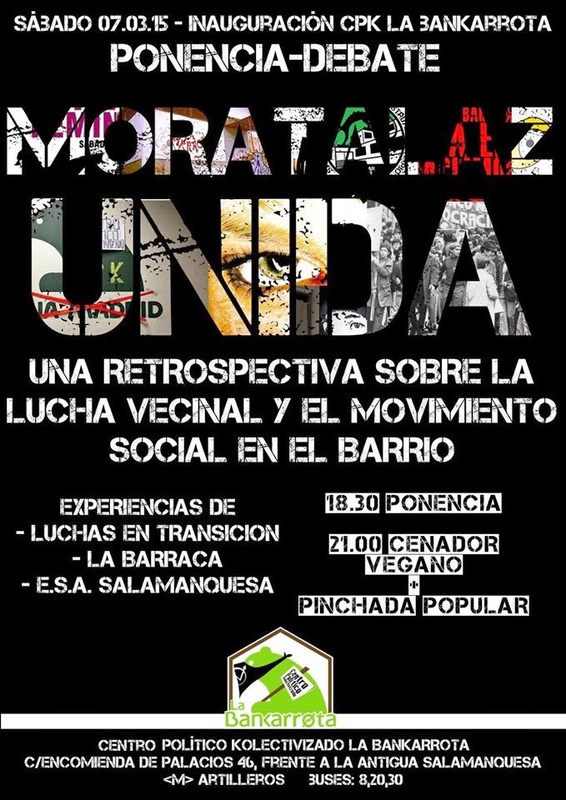 El Campo de Cebada anunció su hartazgo la semana pasada en su Facebook, hartos de violencia y falta de cuidados por parte de los miles de usuarios de ese espacio. Esta es una plaza está esperando desde diciembre la respuesta del Ayuntamiento para sacar adelante un nuevo acuerdo de cesión del espacio que ofrecen al barrio desde hace más de cinco años. El Solar de Grilo, por su parte, ha recibido una amenaza de desalojo recientemente, justo en el momento en el que consolida su dimensión más pública. Aún tenemos frescos el desalojo a traición del bloque de la Obra Social de La PAH "La Cava", donde vivían 13 menores, Los derribos de Ofelia Nieto 29, de Can Vies en Sants, Barcelona y de El Centro Social Okupado La Traba, que condujo a la reclamación del Mercado de Frutas y Verduras de Legazpi para los vecinos, que se reúnen cada martes en Intermediae Matadero amparados por muchos amigos, entre ellos la FRAVM. Haciendo oídos sordos, el ayuntamiento ha sacado ese edificio a concurso; para instalar usos tan necesarios en el barrio como una biblioteca gastronómica y un Spa. A pocos metros de allí se anuncia la construcción de un centro comercial que atenta contra toda lógica urbanística y social. Por todo ello, exigimos el derecho a la ciudad. Exigimos el cuidado y la responsabilidad de las ciudadanas e instituciones de Madrid, para continuar creciendo y ayudando a que estos espacios puedan continuar existiendo, puedan seguir haciendo-en-común. 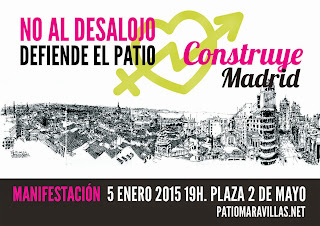 Podríamos empezar con el realojo de El Patio Maravillas en un espacio municipal, y la suspensión de su desalojo hasta que ese espacio no esté cedido con todas las garantías. Sabemos también que no mantendremos tan solo nuestras peticiones, que jamás desaparece la necesidad de un centro social tras su desalojo, que la conquista del territorio en la ciudad está en nuestras manos y en nuestra capacidad de organizarnos, que nuevas puertas encontrarán nuevas ganzúas, y que las nuevas hegemonías encontrarán a nuevos contrapoderes. El territorio urbano es un medio hostil y las personas necesitamos humanizarlo. Seguiremos en ello. Llamamos también desde aquí a seguir a defendiendo y cuidando todos aquellos espacios que nos han permitido ser y hacer en común.